FAYETTEVILLE, Ark. 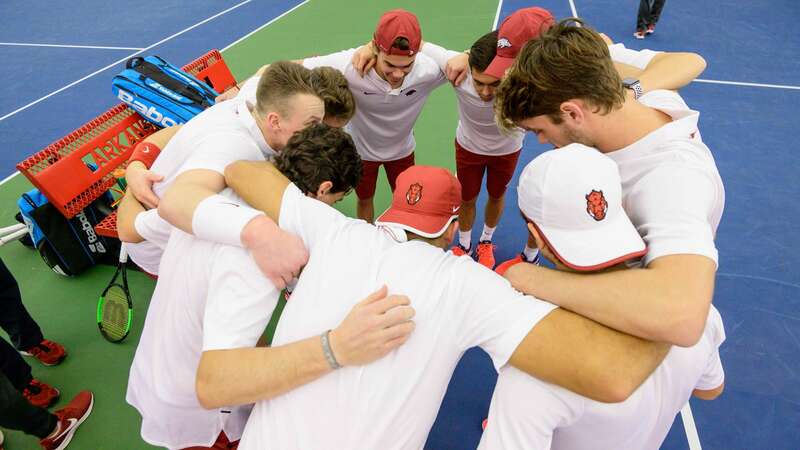 – The Arkansas men’s tennis team is scheduled to return home this Sunday for a pair of matchups against Tulsa and Nebraska-Omaha. First serve against Tulsa is scheduled for 1 p.m. The second match against Nebraska-Omaha will follow shortly after. Sunday’s match will mark the first of eight-consecutive matches at home for the Razorbacks. The Razorbacks own a 5-2 record overall and are currently 4-0 inside the friendly confines of the Dills Indoor Courts. Tulsa posts a 7-1 record, winners of six-consecutive, while Nebraska-Omaha is 2-4. Tulsa is led by Majed Kilani who is ranked the No. 55 singles player in the country. The matches will be the first for the Razorbacks since Jan. 27. The Razorbacks took a match against Cornell Jan. 26 as part of the nationwide ITA Kickoff weekend. The win was the first since 2007 that the Razorbacks advanced to the second round of the ITA Kickoff Tournament. Arkansas dropped its second-round meeting against No. 2 Ohio State the next day. Pedro Dominguez Alonso leads the Razorbacks so far this season in singles dual wins with a 4-1 record, while Enrique Paya, Alex Reco, Adam Sanjurjo and Maxim Verboven own a 3-2 record. Paya and Verboven have led the Hogs in doubles action with a 4-2 record in dual matches.